I have had the opportunity to revisit the Syrian refugee crisis over the past few weeks for study purposes. After looking into it intently almost a year ago, and then revisiting it in May of this year, it is somewhat disheartening to see that although some progress is being made, there is still an awfully long way to go. Throughout my latest research, I came across a documentary about Syrian refugees titled “Generation Standstill”. The title immediately resonated with me as it perfectly and succinctly captures the precise dilemma faced by millions of Syrian refugee children. Not only have they lost the tangible and familiar objects of their past, but they are being robbed of their futures as well. Globally, the UNHCR reported just last month that over half of the world’s refugee children (3.7 million) have no school to go to. Adding to the problem is the rapid rise in worldwide refugee numbers, including children. In 2014 alone, the refugee school-age population grew by 30%, meaning that an additional 12,000 classrooms and 20,000 teachers would be needed annually to meet the demand (UNHCR, 2016). The conflict in Syria has reversed the positive educational trends that the country once enjoyed, with school enrolments dropping from 90% in 2009 to only 60% in June this year (UNHCR, 2016). That 30% drop means that 2.1 million children in Syria are without education. Every. Single. Day…..Indefinitely. For those who have fled Syria, only 39% of Syrian school-aged and adolescent refugee are enrolled in schools in Turkey, 40% in Lebanon, and 70% in Jordan. These numbers equate to a further 900,000 children accessing education. Every. Single. Day….Indefinitely (UNHCR, 2016). So, where does education fit in within a liminal space for those who are now part of “Generation Standstill”? UN High Commissioner for Refugees, Filippo Grandi, states “As the international community considers how best to deal with the refugee crisis, it is essential that we think beyond basic survival. Education enables refugees to positively shape the future of both their countries of asylum and their home countries when they one day return.” (UNHCR, 2016). One thing that has remained constant over the course of my 15 months of reflecting on the Syrian refugee crisis is the reluctance of many countries to actively work to address it. It is evident that the task at hand is too great for Syria’s neighbouring countries, and some countries have gone above and beyond in terms of welcoming refugees and assisting them to settle, recover, assimilate and start new lives. However, the silence of others is deafening. There are challenges for Syrian children to attend education. Some are turned away from schools for not having the necessary paperwork even though legislations states they are able to attend. Others are concerned for their safety when commuting through parts of large refugee camps or foreign countries, or suffer bullying whilst struggling through language barriers. Ohers spend their days, seven days a week, being the sole breadwinner for their families, cutting their education short in order for their family to survive. It is time that the future of learning spaces for refugees adequately addresses these challenges. My mentor suggested mobile education – education that comes to the children. Another suggestion I considered was education via television, as many have access to a very basic television, even in some of the most appalling living conditions. Many others before me have discussed the benefits of education via online channels. All of these are worthy of being considered if there is the chance that children can begin preparing for their future again. So, what can we do when we are not there to help firsthand? What can I do, here in Melbourne? What can you do? Take an interest. As an educator, educate your students to the realities of what life is like for children around the world, refugees and otherwise. With awareness often comes action. We want to ensure that the children whom we are educating today will make informed and empathetic decisions when interacting within their global society. Furthermore, we want the students in our classrooms to understand that refugee education “is one of the few opportunities we have to transform and build the next generation so they can change the fortunes of the tens of millions of forcibly displaced people globally” (Grandi, UNHCR, 2016). And in the meantime, we want to do all that is within our own power not allow “Generation Standstill” to lose both their pasts and their futures. We wouldn’t allow it for our own children, so why should we allow it for any child, any where? I have enjoyed being privy to some of the online conversations of colleagues over the past few weeks as they discuss the importance of Learning Spaces for our 21st century students. More recently, their discussion has revolved around future learning spaces, specifically in relation to refugee crises around the world. As you may be aware, I spent considerable time investigating this very issue last year in relation to the Syrian refugee crisis, with a central focus on Za’atari. This learning experience is something that has stayed with me since that time and one that changed me profoundly. However, I have had the luxury to go on with my every day life and forget that my reality is vastly different from millions of others. I have been distracted with my first world problems without ever feeling fear over my physical safety or long-term wellbeing. So, what was the point of spending all of that time, energy, and emotional investment on a topic which I cannot potentially impact directly? Well, here is where I’ve changed my thinking – as a teacher. I bring my knowledge of global issues into the discussions with my students. I enlighten my students with another perspective of what day-after-day life is like for millions of children their own age. I do this in order to help them to develop an understanding of broader values such as respect, civility, equity, justice and responsibility. As the Victorian Curriculum states, Civics and Citizenship curriculum plays a crucial role in helping our students to become active and informed citizens and to gain the knowledge and skills necessary to question, understand, and positively contribute to the world in which they live. This is home for all of us, no matter what your beliefs. We really are all in this together. I have limited control over the injustices which are in place throughout Syria and beyond. That is certainly not to say that I have given up on working towards them changing. Not at all. However, I realise that some of my greatest power is to have the next generation be more adequately informed on a local, national, and international level. As the Victorian Curriculum states, I know that by ‘investigating contemporary issues and events, students learn to value their belonging in a diverse and dynamic society, develop points of view and positively contribute locally, nationally, regionally and globally’. I have incorporated my understanding of the importance of global issues and future learning spaces (here and around the world) and applied that in a setting where I can have the greatest impact – with my classrooms full of students. Our students may never physically set foot outside of a 100km radius of their current address. However, the children we teach will soon (if not already) be participating as members of our interconnected global society through avenues such as Instagram, Twitter, Facebook, Musical.ly, Snapchat, etc. My aim is to instil the importance for my students to become reflective, active, and informed decision-makers, both now, and in the future. Ultimately, I am aiming for my students to realise the position of privilege they are in due to their own global location, and to use that privilege with a sense of respect, purpose, and to become tolerant, thoughtful, and informed global citizens. Learning today can literally happen anywhere and anytime. This isn’t necessarily anything new. However, with today’s ingrained global-connectedness, we are now able to be exposed to teaching ideas at the touch of a button. Many educators take advantage of having other educators only a click away, and rightly so. Our ability to create an engaging, intelligent, and supportive network of like-minded educators on the other side of the world has never been easier. But, we mustn’t forget to implement these ideas with discretion. What do I mean? Well, it is important that we don’t get so caught up in the next big idea that we forget to accurately consider whether it is right for the group of students we are teaching. As a teacher who is currently doing a lot of casual relief teaching at a variety of schools, I think it is wonderful to see the value that schools currently place on learning spaces. The schools I work in aren’t necessarily in the wealthiest suburbs, nor do they have bucket loads of funding to spend. However, they have ensured they didn’t miss the boat and offer a variety of spaces for their students to learn – indoor, outdoor, online, group spaces, independent spaces, etc. But (sorry…there is a but), it would seem that some educators aren’t recognising that not all spaces suit all learners, and therefore they aren’t preparing an alternative. For example, many schools now offer large, open learning areas where one, two, or even more classes may work together in a shared space. In just the past week alone I worked in a school where four classes inhabited the same learning space (yes, it was huge!). Yet, they simply happened to cohabit the space rather than actively interact with one another within it. The large, open space had become divided with furniture to try and create boundaries and limit noise flowing from one room to another. It also meant that because each group was working independently from the others, some classes were running quiet activities whilst others were running something which created excitement (and noise). Furthermore, it was an uphill battle all day for those students who already struggled to focus or filter our noise as their attention was constantly challenged with activities occurring somewhere else within eyesight or earshot. Let me clarify that I am absolutely an advocate for providing a variety of learning spaces to suit a diverse range of learners. However, educators still must tailor their programs to suit the student group they have from year to year and the learning spaces where they are situated. Teachers don’t often get to choose what classroom they will teach in, and most often they make the best out of whatever room becomes theirs. However, in the instance above, a better alternative may have been to engage in greater teacher collaboration so that classes sharing an open space were also sharing similar learning activities. This would potentially reduce the likelihood of distractions from other rooms interfering with their own students’ learning. Also, a missed opportunity for the four classes mentioned above was that an open learning space invites occupants to share and interact with one another. There absolutely needs to be breakaway spaces for students who need less noise, less sensory input to work. However, if the shared area is effectively utilised, then it can potentially create a more harmonious, large learning environment, instead of trying to manufacture separate ones which challenge each other. So, I would encourage educators to absolutely embrace new technology, new ideas for classroom designs, and new teaching strategies that we are fortunate enough to be able to research and share at the touch of a button. But, please remember to incorporate the ones that will be most beneficial for your student group from year to year whilst making the best use of the learning environments you have to work in. How will you make these spaces work for your students? As educators, we are constantly asking our students to try new things, take risks, make mistakes, bounce back, and try again. And we do this for good reason. We know that growth is achieved through challenging and extending our learners. But, (there’s always a ‘but’), why do we so often find ourselves reluctant to do the same thing ourselves? We are educators and we know what steps need to be taken to achieve new skills and knowledge, but when it comes to putting it into practise for ourselves, somehow we suffer from stage fright and aren’t quite sure we can do what we are asked to. Why is it so uncomfortable to try new challenges and take risks ourselves when we are the cheerleaders for these growth mindsets in our own classrooms? I have wondered whether this is because we are comfortable with the status quo and therefore don’t believe the reward (ie. new skills and knowledge) is worth the risk (ie. failure, embarrassment, time ‘wasted’)? However, even when the learning is connected to skills or knowledge that we want to master, we are often still reluctant to try something new. As an educator who was recently involved in a lot of professional development, I have a newfound respect for our ability to continually challenge, upgrade, and sometimes totally reinvent ourselves. That isn’t to say that the process was always easy (spoiler alert – it wasn’t!). But, it was absolutely worth it. I didn’t always master everything. I certainly didn’t always master things on the first go. I had to let my guard down, be prepared to enter the area so many of us avoid at all costs – a liminal space – unknown territory. However, just as we expect our students to evolve and attempt new challenges, we, too, need to be willing to do the same. As an educator, when it is our turn to try something new and your inner voice starts to whisper words of self-doubt and express a fears of failure, this is your chance to put on your best teacher voice and be your own best support. What would you say to your students if they shared the same worries and concerns with you? You would tell them with confidence, patience, and belief that they should just have a try, that you would be there to support them, and that you knew that they would come out the other side having achieved some element of new learning. So, when you are in the position to extend your own skills and knowledge, remember to be kind to yourself, but never sell yourself short. Flip the knee-jerk panic reaction that you may be personally experiencing and treat it as if it was coming from one of your students. Be supportive of your own learning, lean on those around you who can guide you, and just have a go. You may just amaze yourself with what you are capable of. Isn’t it funny how words can sometimes have new meaning based on your own recent experiences? 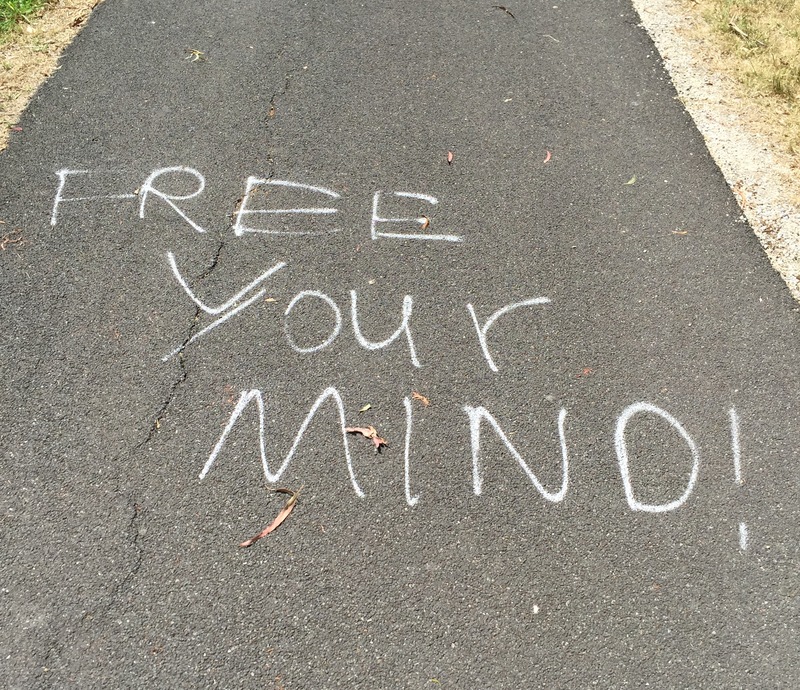 Yesterday, while enjoying the springtime sunshine in Melbourne, I came across some graffiti. I know – not that uncommon. 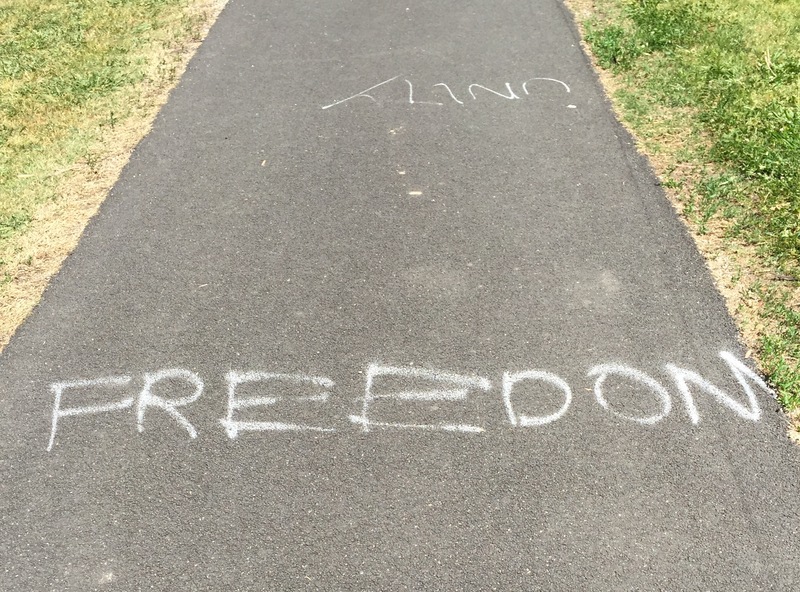 However, I realised as I walked past the series of words left strategically positioned along the footpath that each word resonated differently with me that day than they would have previously. Now, this could mean many different things for different people. However, for me, it was reinforcing the change that has occurred in my own thought patterns. Over the past year, I have spent many hours having my interpretations and perceptions of things challenged, enhanced and transformed. Without this change, my preconceived “understandings” would have continued to limit the choices I felt I was capable of making, particularly in regards to what I could offer as an educator. I have learned to embrace the wonder in the unknown, the beauty in taking risks and the enormous benefits of making mistakes and reflecting on these for an enhanced learning experience. It also seemed relevant due to my recently broadened perspective on what one person’s role as an educator may be able to contribute on a scale much bigger than a classroom teacher. Investigating the Syrian refugee crisis highlighted to me the importance of education on a global scale, but it also freed my thinking beyond that of purely academic learning for any student, whether they be in a refugee camp in Za’atari or in a classroom in suburban Australia. For me, “Free Your Mind” was reinforcing that sometimes we need to let go of old beliefs in order to experience insights into ourselves that we never knew we could. As a teacher, I believe this is invaluable, as we have to remember to role model that we never stop learning either. These two words – Freedom and Unity – written parallel, yet upside down from one another, seemed particularly relevant when considering my new understanding of the situation facing the world regarding the Syrian refugee crisis. In Australia, as with many non-European countries, it is easy to distract and distance ourselves from the issue as we largely don’t have to see or experience the desperation or distraught families trying to find their way amidst chaos and uncertainty. We see snippets of it on our morning or evening news, but we can then redirect our attention to our own busy lives. However, it struck me that the author of these words chose to put these two together in this fashion, for the more I have come to consider the plight of the largest crisis of displaced people since WWII, the more I see that “unity” can lead to “freedom”. When people unite, they can contribute and collaborate to become a stronger force in the effort to making positive change in all of their lives. When countries unite, we spread the load and try and avoid potential “burn out” (for want of a better term) on only neighbouring countries bearing the load of the 4 million refugees trying to escape Syria. When teachers unite, they can share their knowledge, skills and experiences in an effort to embrace a better educational program for our students. Through unity, we can work together towards establishing freedom, whether that be for the refugees or for the students within our classrooms. Perhaps freedom really comes from having unity to begin with, for if you are not restricted by having to challenge for your position in the world (or the classroom? ), then perhaps you have freedom already? I like that this was posed as a question. After all, it is such a personal question that requires intimate reflection to try to respond. 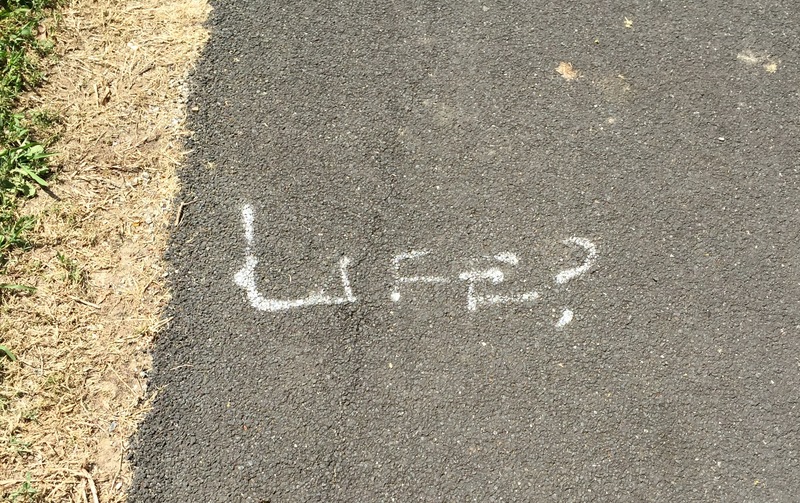 However, in light of the train-of-thought that I found myself on during my sunny midday walk, I felt that this word was asking me to consider what “life” would mean without those things? What sort of life am I expecting others to live if I am unable to free my mind beyond my own relatively narrow firsthand experiences of the world; if I am unable to practice unity within my classroom and as a citizen of the world; and if I am not able to recognise a person’s right to the basic freedoms of humanity that so many billions around the world are privileged to take for granted daily? At the end of my walk, I finished feeling relieved. A strange response, perhaps, given the enormity of challenges that face the world today. However, I was relieved that I had had the experiences over the past year that have given me new perspectives and further insight into what I might be able to contribute as a teacher. Change often begins with one person. I may not be that person that will instigate the huge changes that are needed to fix anything, but what if one of my students are? If I can demonstrate and instil these understandings with my students as their teacher, then I believe I am giving them the opportunity to contribute to more than just their own futures, but perhaps to “the future” on a much broader scale. 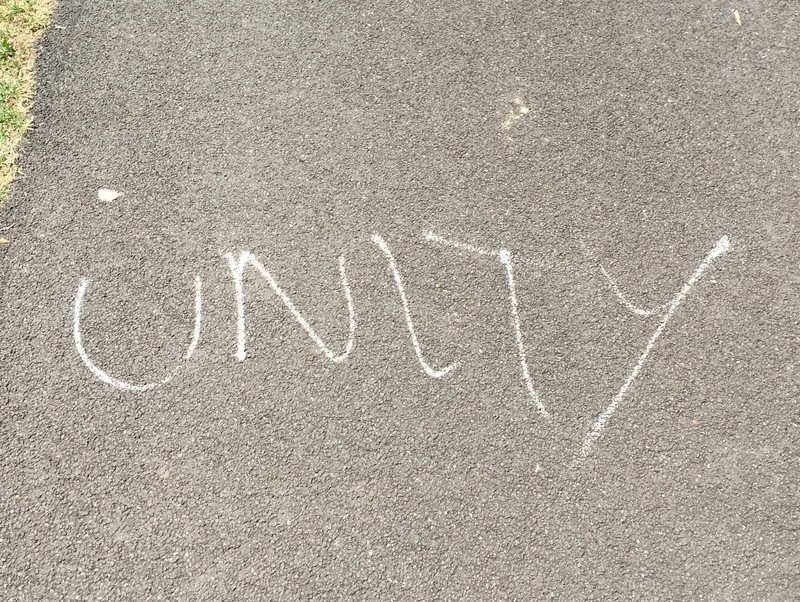 ps – I should probably put this as a disclaimer in that I don’t support or condone graffiti. (However, I certainly am thankful for the timely appearance of these words). Change. It does strange things to people. Some people thrive on change. They seek it out, deliberately trying to bring excitement, newness, adventure or difference to their day-to-day lives. Others avoid it at all costs. For some, even the smallest change can be enough to disturb their inner sense of self, their understanding of their world and/or their ability to cope or function, and as such, change is feared and avoided at all costs. 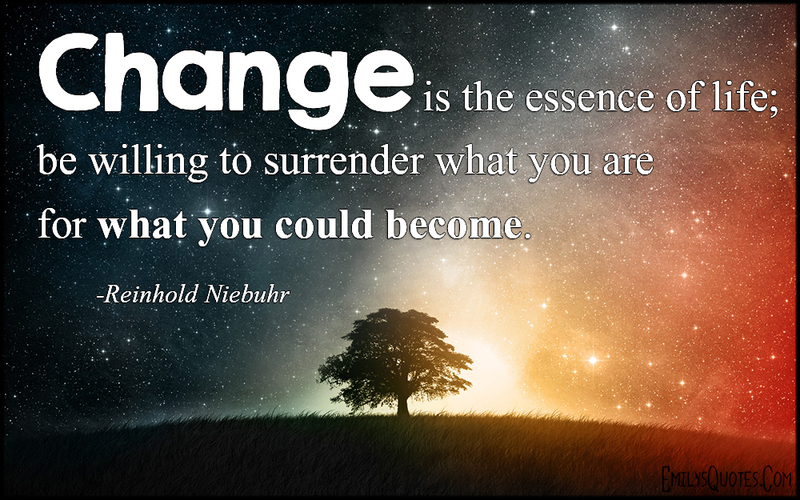 Whether we are able to cope with change or not, the irony is that change is one of the few constant things that joins us on our path throughout our lives. There are the obvious physical changes that we all go through as we age from newborn to adulthood. There are the intellectual changes that we progress through, some though formal learning and others through lessons of life. Then there are also the emotional changes that we experience, and some may argue that these are perhaps the most influential of all, particularly when it comes to how we perceive future changes. Being on the threshold of change can be cause for emotional turmoil, particularly if you are unsure what that change is actually going to be, such as in the case of many of the Syrian refugees I have been studying lately. However, being on the threshold of a known change, whether a change by choice or by necessity, can also be cause for a similar response. Some people say it is the waiting, the not knowing, that is the worst. Preparing for the unknown. Very few people crave uncertainty. But, it is part of life. So, how do we help our students cope with it? There are many variations of a popular quote, but ultimately I see this as a way of trying to intellectually remind ourselves to try and reduce the impact of our impulsive, emotional responses to liminal spaces. After studying just some of what the Syrian refugees in Za’atari are coping with, I would argue that sometimes it IS about what has happened to you. 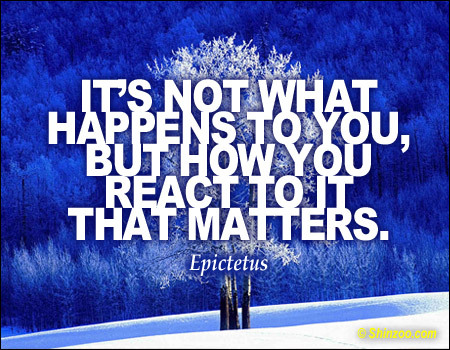 But, I would also agree that how you react matters as well. The most inspiring things about the Za’atari refugee camp was the ability whereby so many people displayed a commitment to overcoming their adversity and to making steps towards their inevitable changes becoming positive ones. This is no easy feat, especially given the dire state of affairs and limited resources at their disposal. On a slightly different tangent, I have also seen the enormous challenges that my own son, who has autism, has had at times with change. With a great deal of guidance and tuition, he has learnt tools to help him cope with change. He has gotten particularly good at coping with the little, annoying changes that may not even bother many people, but they are ones that are significant enough to come up on his radar and disturb his emotional-balance at that moment. He is now able to reduce the emotional impact of these and concentrate on how he reacts instead. Not always, but a lot more than he used to be able to do. However, one thing he still struggles with, as do so many others (whether they be on the autism spectrum or not), are the long, drawn-out changes. The ones where we aren’t sure what is actually going to happen. The ones with no definitive answer….yet. The liminal spaces filled with ambiguity and uncertainty. It is during these times that we often rely on our own inner voice to reassure us that we can get to the other side in one piece. For my son, that is when he needs others to become his inner voice to quiet his fears. For many Syrian refugees, I believe it is similar – they need citizens around the world to demonstrate that we will help alleviate their fears about the changes they are forced to face. As an educator, perhaps how we approach change in our classrooms can help equip our students with some of the tools they will need now and in their futures. Liminal spaces, or being on the threshold of the unknown, offers an opportunity for a person to reflect and evaluate what is important to them and for them as they prepare to react and move forward. Perhaps if we encouraged our students to look inwards during times of uncertainty we could help guide their inner voice to react in a way that offers optimism and confidence. This would offer chances to highlight and remind students of past times when they were faced with, and coped with, change. If we could assist students dealing with change to not view it as unavoidable, annoying part of life, but rather as an opportunity to learn about ourselves and our incredible abilities to transform (even without noticing), imagine how this might prepare them for the changes they will face throughout their futures? I found it useful to use a mind map to highlight areas that need to be considered and addressed whilst developing useful and meaningful learning spaces which respond to the educational and developmental needs of the children in Za’atari.